I love me some coffee! I've enjoyed coffee for many years, but it's become quite a treasure since becoming a parent (can I get an AMEN?!?!!)! I've made butter coffee before and I love grabbing a Starbucks double shot when I'm out driving for awhile, so I wondered if this would be a mix of the two. Whenever I tried butter in coffee I always also added cream because it just wasn't quite what I was looking for. The creaminess was lacking. I've heard I should have blended it with coconut oil and then it would have been better. Maybe next time. 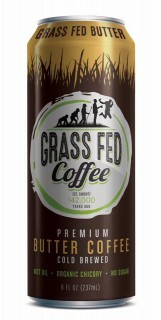 In the meantime, I had Grass Fed Coffee to try. Man you guys, this coffee did not disappoint. It was so smooth and light without tasting weak. I am NOT a fan of bitter coffee, nor am I a fan of weak coffee and this was neither. Goodness, I never realized I was a coffee snob, til writing this post! Ha! Anywho, this stuff was awesome! Seriously so tasty. It was like a double shot but better. More smooth, less sweet. It's sweetened with xylitol so there's just a slight hint of sweetness, which I like. I would say if you like the fru-fru super sweet frapps, this may not be your thing. However, the taste is so smooth you might be surprised. The can says to shake it well, and I thought I did until I opened it and began to drink! I should have shook it vigorously, and then shook it again! After my first drink I noticed there was butter on the sides of the can. Shoot! And I wasn't home yet...so I waited until I drove home to finish the drink. Once home I used a straw to scrape down the sides of the can and finish the rest. Tasty tasty! Like one of those drinks where you have to remind yourself it has caffeine so you don't just guzzle it all day like water. Right now they're at the tail end of their kickstarter campaign, so if you'd like to help support them and preorder some Grass Fed Coffee, you can click this link and join the party! The kickstarter ends on Monday, so hurry over!! *Also, one final note...I LOVE the transparency they have on their website. Just take a peruse of their FAQ page and you'll be impressed to see how they address every single ingredient listed in their product. I, myself, was a little disappointed to see carrageenan in the ingredients list as I've heard mixed things about it, but they address that. I'd have to do more research, but they said the form of carrageenan they use is a safer alternative and the only way to keep the butter, oil and coffee all nice and mixed together. 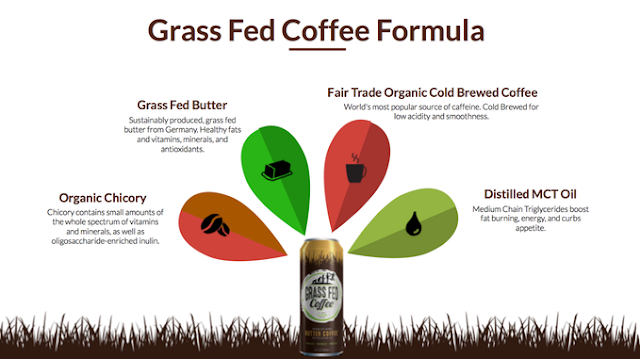 Good luck Grass Fed Coffee! We wish you all the success! We love pancakes in this house, but I'm totally over the gluten free flour blend (and baking recipe) additives like guar gum and xanthan gum. That's why I've been on a perfect pancake recipe quest for the past few months. It's been a great way to break in the new kitchen at our new house (we moved in August)! :) Plus, our little lady LOVES to help and pancakes are a great recipe to make with a toddler. In fact, she may now whisk eggs better than me! Teehee! So, with my sidekick by my side, I figured out a pretty perfect recipe. These cook up great every time and they have an amazing flavor. Did you notice the "banana bread" title of this post? Seriously, these babies have a distinct banana bread flavor. To quote my (non-gluten free) grandmother-in-law, "Did you come up with this recipe? You need to write a cookbook!" Aww, thanks GG! Maybe one day. For now, I'm enjoying a less hectic pace of life. I'm also looking to decrease the amount of sugar intake for my family (the holidays did just end! ), which is why I was so happy that the addition of bananas to this recipe was almost enough sweetener for my gal and hubby. I may try them sometime without any sweetener, but I also want the family to eat them so I'm keeping a little bit in there for now! One last note, for this recipe I used basic rice flour as we're also trying to avoid all other grains. For a more Paleo-friendly recipe I've included a link at the bottom of the page to an excellent coconut flour recipe. 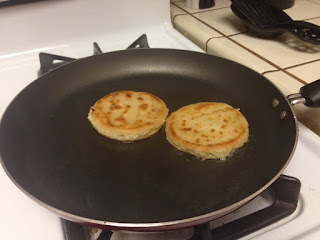 In my quest to create great gluten free pancakes I was also dabbling in trying to create a Paleo recipe for mornings when I wanted the pancake to be a more complete meal (most Paleo recipes require 4-6 eggs). In large mixing bowl, mash both bananas (I found using a large serving fork is great). Add eggs, flour, milk, sugar, baking powder and vanilla to the bowl. Heat griddle over medium to medium low heat. Grease with butter and cook pancakes until edges start to dry out (about 2 min) before flipping. I've also done the following with great results. Sub sugar with maple syrup (only 1 1/2 Tblsp). Add 1/2 cup finely chopped walnuts or pecans. For a Paleo-friendly recipe, use this one by Nourishing Days! After making it this morning I'm done (for now) trying to create my own. I did have to watch these more (read: cook at lower temp and therefore cook longer), but the flavor and smell were amazing! Get your pancake cooking on and ENJOY! It’s a new year and with a new year often comes resolutions, the most common of which is to lose weight. For those of you with that goal, this post is for you. I had the opportunity to review a new book called, “The Bone Broth Diet,” by Dr. Kellyann Petrucci. Dr. Kellyann is, "a naturopathic physician and a certified nutritional consultant with more than 20 years clinical experience.” In her book, Dr. Kellyann gives a 21 day weight loss plan as she discusses how personal issues with inflammation, whether in joints or the gut, are directly related to the foods we eat. I love this! I’ve seen improvements in my own health and the health of those that I love as we’ve changed our diets. In our house, we’re about 80% Paleo (we eat rice a few times a week as it doesn’t bother us and we drink raw milk) because that’s what I needed to do to feel “well.” My parents, on the other hand, are more strictly Paleo. We all still eat high quality dairy, such as raw cheese and grass fed butter. In my journey of going gluten free (I have Celiac disease), I’ve done a lot of research regarding food and found how beneficial it is to eat a quality diet. In her book, Dr. Kellyann addresses which foods are beneficial to improving inflammation (bone broth baby!) and which foods actually increase inflammation (hello, canola oil!). To give my readers, who are interested in losing weight, a fair review of this book, two of my family members will be following this diet for weight loss. After they’ve embarked on this journey I will let you know their thoughts and success. Now, I myself am not looking to lose weight, but I still wanted to see what improvements I would see in my health if I made bone broth a part of my regular diet. So, while I’m not going to pursue the bone broth fasting days, as outlined in “The Bone Broth Diet,” I am going to start to drink a cup of bone broth each day and see what benefits I notice. What I appreciate about Dr. Kellyann’s book is that she spends time explaining where she’s coming from and how the incorporation of bone broth can do wonders for our health (from weight loss, to hormone balance and better skin). 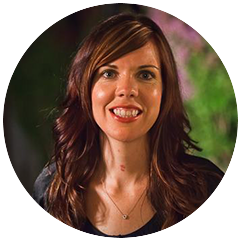 She talks about common food misperceptions and how that has worked against so many people’s goals of better health. She then outlines the many benefits of bone broth before she goes into how the diet works. If you chose to buy this book and follow Dr. Kellyann’s advice, you’ll be on a 21 day plan where you “fast” two days a week and drink bone broth on those days. What’s so helpful, is that you’re also given a specific list of foods that you will eliminate from the diet. So cool! I remember first going gluten free and being so overwhelmed thinking, “What can’t I eat? What CAN I eat?” Dr. Kellyann does just that. She explains why the foods you can’t eat are no good for your health and then she outlines what foods will promote optimal health and weight loss. Check out her book. The lists are so easily laid out and she provides a 7 day general meal plan to get you going, plus multiple bone broth and meal recipes. This book is so thorough. At first I thought it was really long and involved. But then I thought back to the book "It Starts with Food" (how my family began the Paleo journey) and how nice it was to start out a new way of eating with a roadmap and recipes. Bravo Dr. Kellyann! This books looks like it will set up weight loss seekers with guidelines for success! 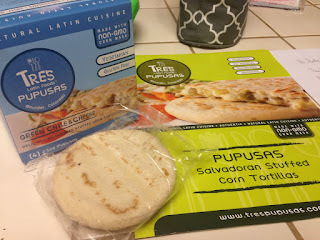 Gluten Free Tres Pupusas... Why yes please! I've never had a Pupusa before, so the thought of it intrigued as well as worried me. I had to pull this from their site as I still have no clue what they are. Originating from El Salvador, a pupusa is a stuffed corn tortilla filled with delicious goodness. Our pupusas are produced with organic, non-GMO corn masa and are naturally gluten free meals. Pupusas are traditionally served with a side of curtido (cabbage slaw with vinegar) and salsa roja. You can find the recipe for curtido below. Guacamole is also a delicious complement to our gluten free pupusas, and for breakfast, they are perfect with a fried egg or two on top. Now if you've never had organic corn before, you need to stop what you're doing and run out into the nearest organic corn field and grab an ear of corn. Though, I wouldn't recommend that as you may get in trouble. They come in several flavors and the first ones I tried were green chile and cheese. I really wish I had gotten the bean and cheese ones, but I guess it's okay trying things out of the norm. To cook, the owner of the company suggested you use enough oil to coat the pan and cook for 4-6 minutes on medium heat. Now I wanted mine a little crispy so I did each side for about 4-5 minutes on medium heat. I ran out of sour cream so I substituted it with yogurt. I was very surprised that the green chiles didn't overpower the flavor. A lot of times, people who use green chiles add too much where all you can taste is the chile, but it's a very balanced flavor across every bite. Overall I was a bit shocked with how tasty they were. I've gotten used to cooking all of my own food and not buying packaged products, but these tasted restaurant fresh! Now if you want to buy a package of these, you won't be disappointed as they truly are a great snack. I say snack because I could've eaten 10 of them. Over here, at the Shat's house, we have been listening to Christmas music since the start of November. I equate Christmas music to happy music and it keeps me in a chipper mood even though I now must wear shoes and long pants (I live in CA, so we were wearing shorts through October)! And once the Christmas music starts, so does the festive eating. I love to cook, and since becoming a SAHM I do it quite frequently so I'm loving when I create quick, easy and delicious items for my family to enjoy. Thanksgiving was no exception. I wanted something simple and easy that my family would enjoy, but that my toddler would also want to eat! Can I get an AMEN?!?!!! Finely chop 1/2 jar of sun dried tomatoes. Mix with 1/2 block cream cheese. You may need to put the mixture in a saucepan over low heat for a bit to make the mixing process easier (I did). 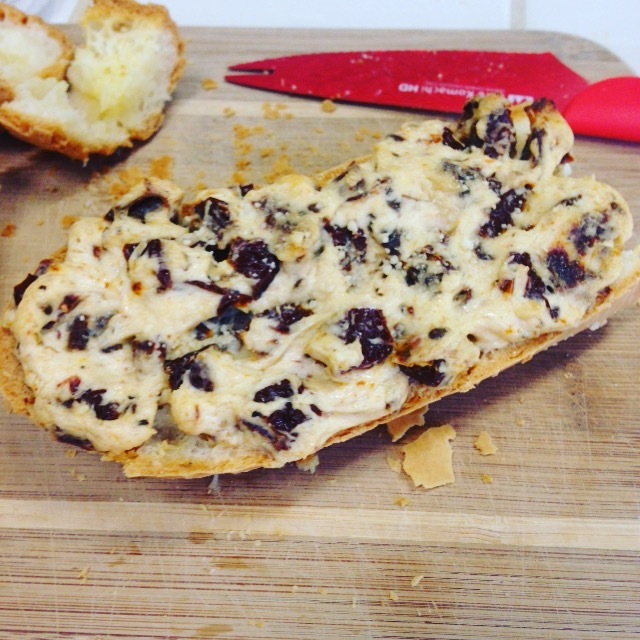 Once items are combined, slice the baguette in half, lengthwise, and spread the mixture on both halves. Place on cookie sheet in preheated oven for 10 min or until bread is toasted to your liking. Remove from oven and allow to cool a few minutes before slicing. This will smell amazing! Prepare to indulge yourself and your guests! Welcome to Surviving In A Gluten Filled World. I'm Rachel - I love chocolate. I'm passionate about health, travel, and food. This blog is a place where I want to share all the things I love to you! Costco's Rotisserie Chicken GLUTEN FREE! Tasty Gluten Free Tortillas AND a GIVEAWAY! !